Home IT Data center managers: Is it worth it to purchase Cisco ACI? Data center managers: Is it worth it to purchase Cisco ACI? 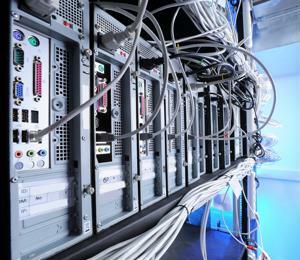 Cloud computing, big data and the Internet of Things typically receive the brunt of attention when it comes to the evolution of data center technology. When we say "evolution," we're not referring to the procurement of "more sophisticated" networking and server assets. When IT professionals discuss legacy data centers, they're not only talking about antiquated equipment, but also the way it's designed. But we digress. Behind the list of buzzwords permeating the IT industry (the three most prevalent are noted above) are applications, and lots of them. From NoSQL databases to customer relationship management solutions, data center configurations are designed to support a diverse range of software. A signature component of ensuring lean, dependable application delivery necessitates that attention be given to the network. Cisco's solution: The answer to software's prayers? In regard to procurement, officers want to purchase networking solutions that are sustainable, meaning they won't have to be replaced five years down the road. In addition, they want to acquire the minimal number of assets. Cisco, being one of the most prominent companies in IT networking technologies, offers a package that it asserts is designed for the application-focused data center. Cisco Application Policy Infrastructure Controller provides users with performance surveillance, policy enforcement and other management tools from a centralized location. In Cisco's words, it "unifies operation of physical and virtual environments." Application Network Profiles provide logical representations of an application's parts and interdependencies. These are where application policies and necessities are defined, allowing ACI to regard these protocols, compare them with those of other solutions and design the network architecture accordingly. Cisco Nexus Portfolio offers modular and fixed 1-gigabit, 10GB and 40GB Ethernet switch designs that are tailored to serve as the fabric for the entire solution. From an IT management perspective, this technology offers a wide variety of benefits. In many ways, Cisco ACI signals the dawn of an era in which applications dictate the operability of a data center, not the other way around. This environment accommodates the needs imposed by end-users - the ultimate target audience IT professionals are working to satisfy. Is it the greatest thing since sliced bread? InfoWorld contributor Serdar Yegulalp conducted a review of Cisco ACI, lauding the company for its recognition of a problem that has hindered application versatility, development and operability. However, he acknowledged that this solution isn't the only answer to the issue, referencing the prevalence of software-defined networking. Sure, abstracting network resources from the physical infrastructure helps, but hardware remains at the root of the challenge. Cisco Nexus Portfolio intends to answer the call, but the catch with using Cisco ACI is that it necessitates the procurement of more Cisco technology. This isn't idea for a data center that is using ODM switches running Linux. In many ways, Cisco ACI is a way for the enterprise to compete with OpenFlow - the SDN solution of choice for many. Thus comes the argument that Cisco may be trying to protect its 60 percent market share of the networking industry. However, this isn't necessarily a bad thing. If Cisco feels threatened by the prevalence of other application-aware network products (ACI isn't the only one), then it's likely that the company will do everything it can to make ACI vastly superior to its competitors' offerings.